This post has already been read 3895 times! KEARNEY – Len Fangmeyer is starting to feel like a Student Diplomat. The manager of the University of Nebraska at Kearney’s Antelope Bookstore has become an impromptu tour guide at the Nebraskan Student Union, leading the lost to meeting rooms and offices that are suddenly hard to find within the active construction site. The building is a maze right now, but Fangmeyer is willing to deal with a minor inconvenience for a major payoff. “It will be worth it when it’s done,” he said. 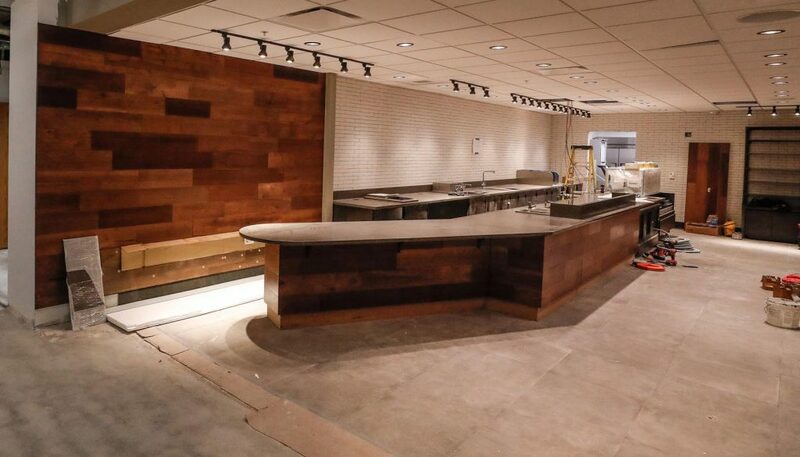 Construction crews are entering the final phase of a $6 million renovation project that will upgrade a significant portion of the union space while adding a Chick-fil-A and full-scale Starbucks. 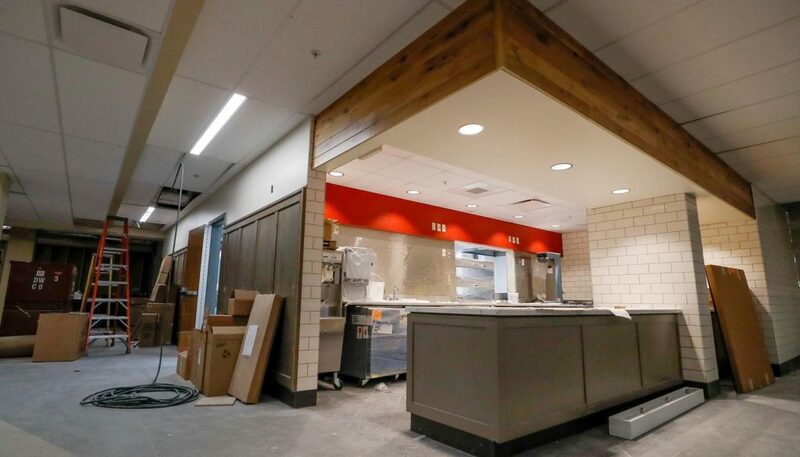 Phase one of the work, which focused on the restaurant and coffee shop, is nearly complete and general contractor Hausmann Construction of Lincoln is ready to turn its attention to the other improvements during summer break. This includes a remodeled food court, welcome center, second-floor balcony and student lounge featuring a gas fireplace. New interior finishes – flooring, paint, ceilings and light fixtures – are planned throughout the union and the grand staircase will get a new glass handrail and guardrail. Improved HVAC and sewer systems are also part of the project. “Barring any unforeseen obstacles, construction is on track to finish in early September,” Brandon Engler, project manager with Hausmann Construction, wrote in an update. Fangmeyer and other bookstore staff can already tell people are anxious to see the finished product. 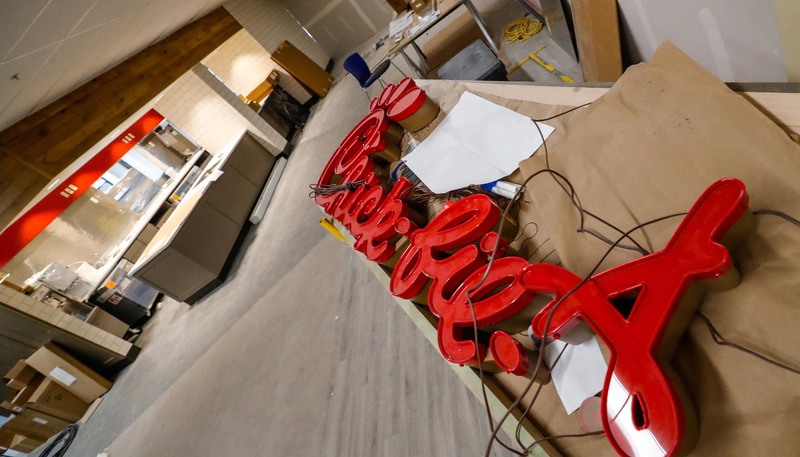 The Chick-fil-A location started popping up in Google search results in December, prompting community members, out-of-town visitors and Interstate 80 travelers to stop in only to learn the popular fast-food restaurant doesn’t open for a few more months. “We have somebody come in at least once a week,” said Fangmeyer, who believes the eatery known for its chicken sandwiches and waffle fries will be a “big draw” for UNK’s student union. Two restaurants – Rustic Range and Lantern – closed to make room for Chick-fil-A and Starbucks, and the space formerly occupied by The Living Room coffee shop will be converted into the student lounge. Subway will remain in the student union. Kersten Mosley, a senior from Minden who also works in the campus bookstore, is pleased with the entire renovation plan. “I’m excited to see what’s going to happen with it,” she said. So is Tim Danube, associate director of the Nebraskan Student Union. All restaurants inside the student union and the bookstore are open to the public, and offices for multicultural affairs, student engagement, fraternity and sorority life and student government are also located there. Fangmeyer hopes to see more community members and students dropping by the union to eat – and buy Loper gear from the bookstore – once everything opens this fall. “I think it will add foot traffic to the union, which has been desperately missing the last couple years,” he said. The renovation, which started in December, is being paid for with facility reserve funds and vendor investments. No state funds went to the project.